At Douglas, we believe in the power of image — how you present yourself tells your customer exactly who you are. It's our job to work with that image. Enhance it. Present it in a unique way. Create a look that's functional, memorable and above all pleasing to the eye. Beveled edges...holographic foils...acrylic inserts...3D individual letter graphics. For depth, dimension, and durability—Douglas has a multitude of options for unique product graphics that will get noticed and advertise your name for years. 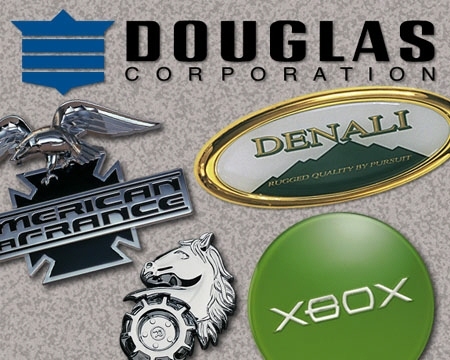 Designing and manufacturing product nameplates comes naturally at Douglas Corporation...we’ve been doing it since 1933. Call today for a free sample board.